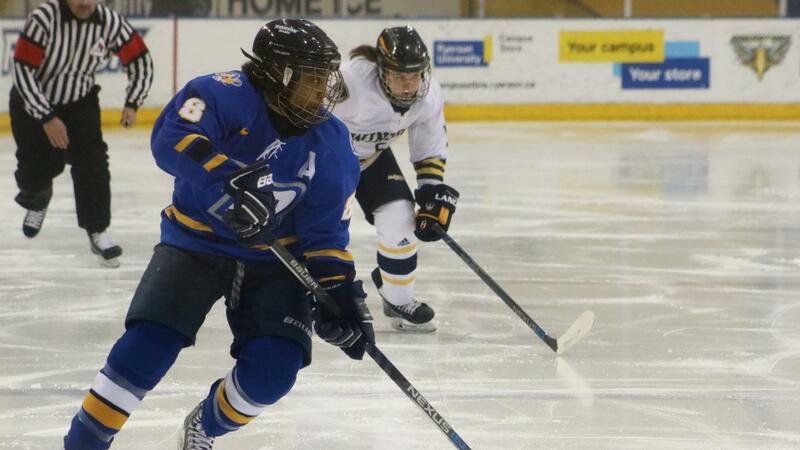 Ryerson’s women’s hockey team fell 2-1 to the Windsor Lancers at the Mattamy Athletic Centre on Friday night. The Lancers went up 2-0 on the eventual game-winner near the halfway point of the second, as Emily Bowman skated in alone and buried a shot from the slot with three Rams below the goal line. Ryerson got its first powerplay goal of the season near the middle of the third period, as Kryshanda Green buried the loose puck in a scramble in front of the net. Her fourth goal of the year ties Green with Ailish Forfar for the team lead. The Rams nearly tied it in the dying seconds of the game but Windsor goalie Molly Jenkins got across the crease with her pad for the best of her 17 saves. Leading 1-0 to start the second, Windsor nearly made it a two-goal game less than three minutes in. Larissa Borowiec kept and shot on a Lancers two-on-one, but rang the puck off the crossbar. The Lancers had the Rams hemmed in their own zone for most of the second before Bowman scored. Windsor outshot Ryerson 9-3 in the period as Rams goalie Sydney Authier made eight of her 19 saves. The Lancers opened the scoring just 20 seconds in as Meredith Goldhawk went five-hole on Sydney Authier for the first period’s only goal. Ryerson’s best chance of the period came on a breakaway after Alyssa Connolly stole the puck with a pokecheck at the Rams blueline, but the third-year forward shot the puck wide near the six-minute mark. With the win, the Lancers improve to 3-0-3-1 and move into sixth in the OUA. Ryerson falls to 10th with a 1-1-2-2 record. UP NEXT: The Rams play the second of back-to-back games at the Mattamy Athletic Centre on Saturday afternoon against the Western Mustangs. Puck drop is set for 2 pm.